BARCELONA, SPAIN—No country in the Mediterranean region meets two key minimum conditions for global sustainable development: living within the planet’s natural resource budget and satisfactory well-being for its residents, according to a new brief to be launched at the SwitchMed Connect conference October 29 by Global Footprint Network. Global Footprint Network monitors the first condition by tracking humanity’s demand for renewable resources and ecological services (Ecological Footprint) against the planet’s ability to provide for this demand (biocapacity). The United Nations’ Human Development Index (HDI) tracks human well-being nation by nation. 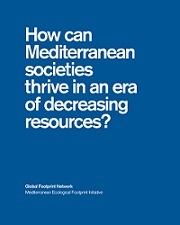 Global Footprint Network’s brief—titled How can Mediterranean societies thrive in an era of decreasing resources?—shows that the overall Mediterranean region is using approximately 2.5 times more renewable resources than its ecosystems can provide. Meanwhile, the majority of Mediterranean countries have improved the quality of life for their residents in recent years, as measured by HDI. The brief, produced with the support of the MAVA Foundation and UNESCO Venice office, highlights increasingly protein-intensive diets among the contributors to the region’s growing Ecological Footprint. Based on a Footprint analysis of 12 cities, the brief also identifies housing and transportation in cities as major opportunities to build a more sustainable Mediterranean region. “The good news is that by targeting food, transportation and housing, the region has numerous opportunities to manage its resources more sustainably and become more economically resilient,” Galli added. Galli will co-host a SwitchMed Connect session on sustainable food at 10:30 a.m. CET on October 29. The Mediterranean brief is available online in English, French and Arabic. The U.N. Human Development Index measures the development level of a nation based on the life expectancy, education and income of its residents. On a scale of zero to one, the U.N. Development Programme defines 0.7 as the threshold for a high level of development (0.8 for very high development). Since 2000, most of the Mediterranean countries have moved beyond that threshold. 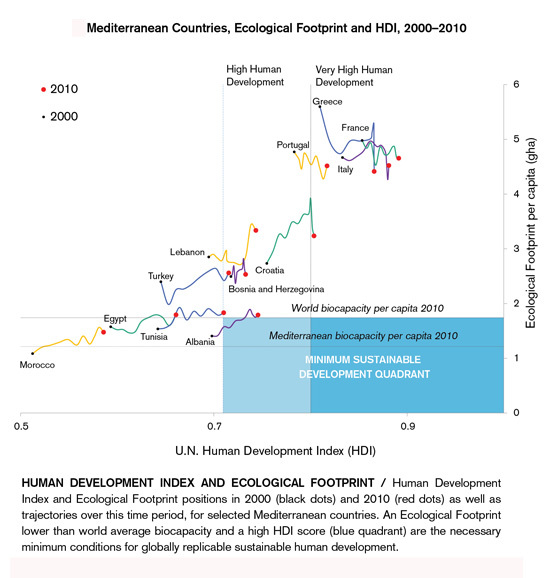 Today only Morocco and Egypt have a HDI score less than 0.7, although their scores are also rising. The concept “within the means of nature” is measured by the Ecological Footprint. The Footprint adds up the competing demands on the planet’s productive surfaces, including food, fiber, timber, carbon dioxide sequestration and space for infrastructure. At current population levels, our planet provides only 1.8 global hectares (gha) of biologically productive surface area per person. Thus, although nations’ resources vary widely, the average Ecological Footprint per person worldwide needs to fall significantly below this threshold to accommodate larger human populations and also provide space for wild species to thrive. However, the majority of Mediterranean countries (except Palestine, Morocco and Syria) have a per capita Footprint up to 1.5 times higher than this 1.8 gha threshold. 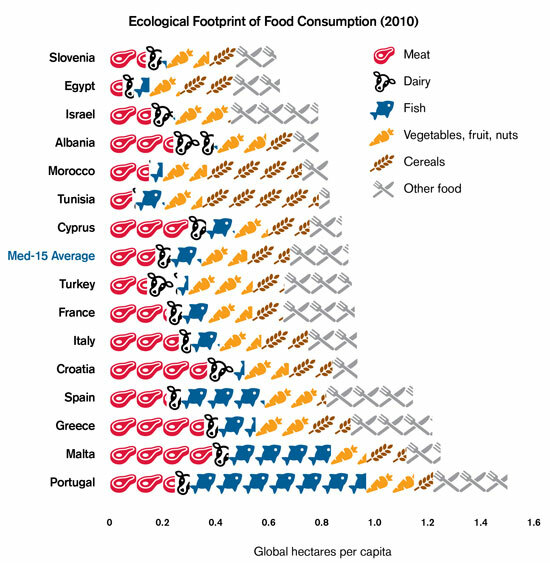 The average Food Footprint of a Mediterranean resident is approximately 0.9 gha per person—with a range from 0.6 gha to 1.5 gha—thus higher than that of such countries as India (0.4), China (0.5), Costa Rica (0.6 gha) and Germany (0.8 gha). • The Mediterranean city with the highest total Ecological Footprint is Cairo, followed by Barcelona and Rome. 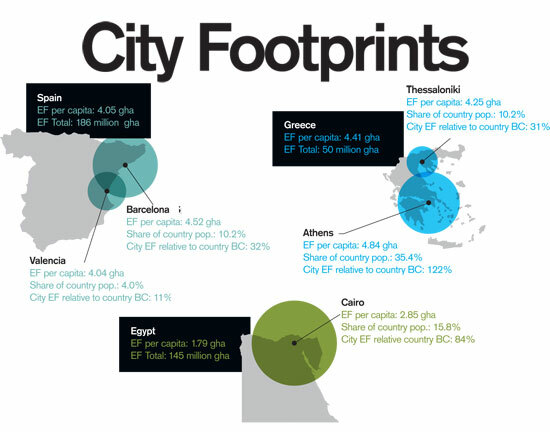 • The Mediterranean cities with the highest Ecological Footprint per person are Genoa, Athens and Rome. • The Mediterranean cities with the lowest Ecological Footprint per person are Antalya, Cairo and Izmir. • The demand for renewable resources in Athens exceeds the entire nation of Greece’s supply of resources by 22 percent, although the city’s population comprises about a third of the nation’s population. • Residents of Cairo (about 16 percent of the country’s population) demand about 85 percent of the overall country’s biocapacity. • Transportation is the single most important Footprint driver in Athens, alone demanding approximately 36 percent of the country’s biocapacity. Municipal transportation policies in Athens could thus likely lead to a noticeable reduction in the Ecological Footprint of Greece. Read the Mediterranean brief in English, French or Arabic.